What is the EOMONTH Function? The EOMONTH Function is categorized under Date/Time functionsFunctionsList of the most important Excel functions for financial analysts. This cheat sheet covers 100s of functions that are critical to know as an Excel analyst. The function helps to calculate the last day of the month after adding a specified number of months to a date. As a financial analystFinancial Analyst Job DescriptionSee a real Financial Analyst Job Description including all the skills, experience, and education required to be the successful candidate for the job. Perform financial forecasting, reporting, and operational metrics tracking, analyze financial data, create financial models, the EOMONTH function becomes useful when we are calculating maturity dates for accounts payable or accounts payable that fall on the last day of the month. It also helps in calculating due dates that fall on the last day of the month. In financial analysis, we often analyze revenue generated by an organization. The function helps us do that in some cases. Start_date (required argument) – It is the initial date. 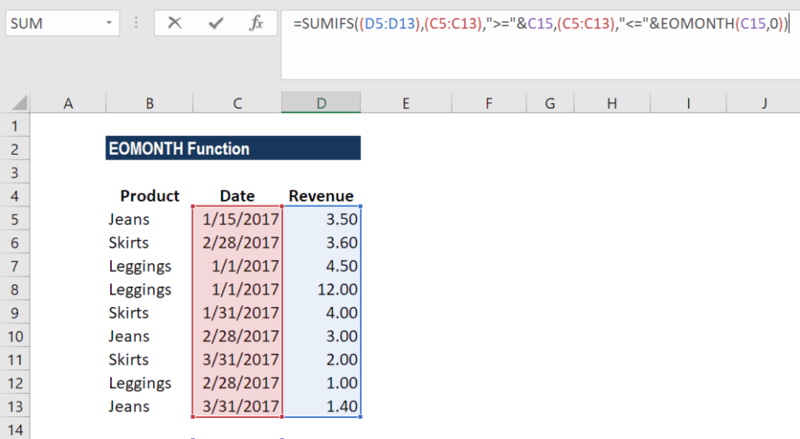 We need to enter dates in date format either by using the DATE function or as results of other formulas or functions. For example, use DATE(2017,5,13) for May 13, 2017. This function will return errors if dates are entered as text. Months (required argument) – It is the number of months before or after start_date. A positive value for months yields a future date; a negative value produces a past date. 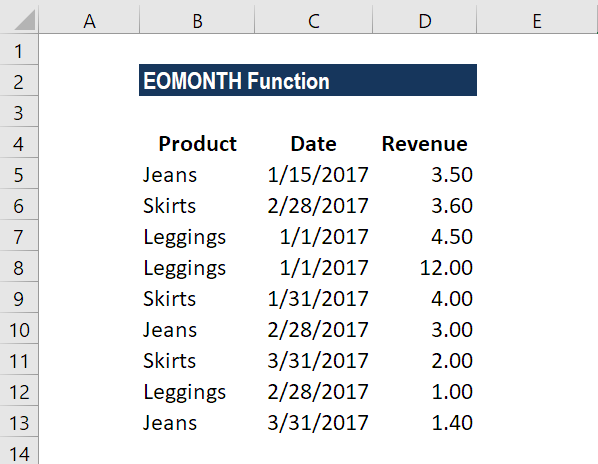 How to use the EOMONTH Function in Excel? In Row 2, the function added 9 to return the last day of December (9+3). In Row 3, the function subtracted 9 to return July 31, 2015. In Row 4, the function just returned January 31, 2017. In Row 5, the function added 12 months and returned the last day in January. In Row 9, we used the function TODAY so EOMONTH took the date as of today that is November 18, 2017, and added 9 months to it to return August 31, 2018. Remember that the EOMONTH function will return a serial date value. A serial date is how Excel stores dates internally and it represents the number of days since January 1, 1900. The SUMIFS formula added up all sales that occurred in January to give 24 (3.5+4.5+12+4) as the result for January. Similarly, we got the results for February and March. One was to match dates greater than or equal to the first day of the month. Second, to match dates less than or equal to the last day of the month. Remember in column E, we must first type 1/1/2017. Then, using a custom format, change it to a custom date format (“mmmm”) to display the month names. If we don’t do it, the formula will not work properly. Using concatenation with an ampersand (&) is necessary when building criteria that use a logical operator with a numeric value. Hence, we added it to the formula. 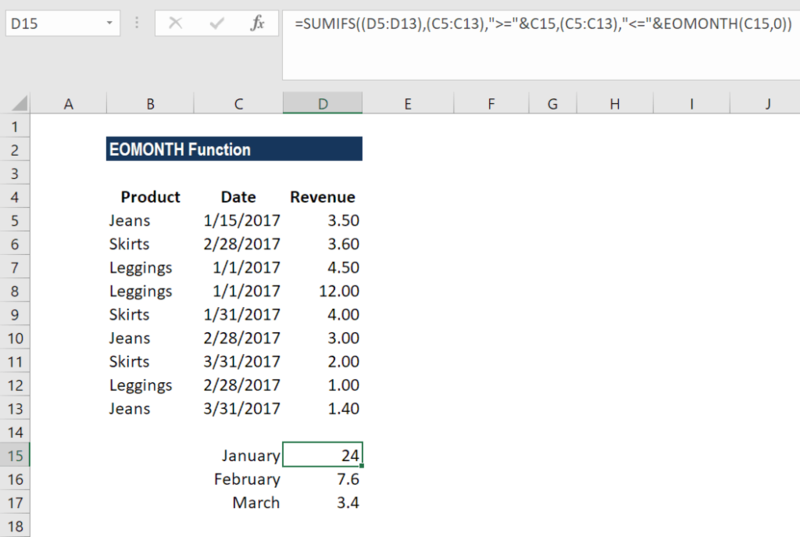 The supplied start_date plus the value of the ‘months’ argument is not a valid Excel date. #VALUE error – Occurs if any of the supplied arguments are non-numeric.